This post is sponsored by Dreamfields Pasta. Thanks for supporting the brands that make DK possible. How is the New Year going? As I wrote back in this post a few weeks ago, I believe in the power of intention. I don’t necessarily set new years “resolutions,” but I do set intentions- thing I intentionally want to work on for the year that encompass all aspects of body, mind and spirit. After working with clients for years on various goals, I also believe in the power of behavior and habit change instead of abstract goals. For instance, if the goal is to lose weight, we might focus instead on where we can add in mindful movement. Activities that feel good and move the body to empower confidence — and perhaps weight loss as a side effect. That positive behavior goal sounds a lot better than weight loss, doesn’t it? That’s why I believe in small changes that have a large effect– like adding in more vegetables, adding more plant-based foods to your meals and stocking your pantry with nourishing foods. I don’t see the benefit in restricting foods so much that they add stress or guilt. You’ll never find me doing a dry January, a sugar-free cleanse or cutting out carbs. Research shows time and time again that these vows may work in the short term, but they almost always (90-95%) of the time backfire into binges, disordered eating patterns, weight gain or shame around feeding. 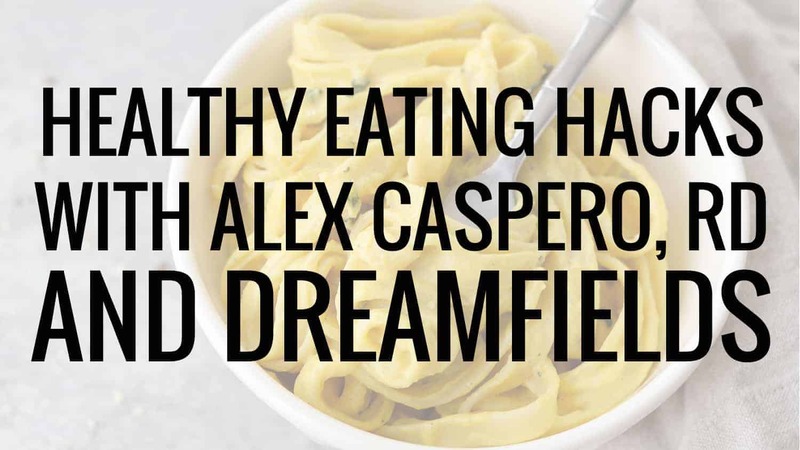 That’s why I’ve teamed up with Dreamfields for their Healthy Hacks program this month. Creating simple, do-able swaps that anyone can achieve. For the next three weeks, Dreamfields will be sharing valuable tips, or “hacks”, to help you achieve health goals for 2018. Head here for more information AND a chance to win some amazing prizes. Grand Prize – $1,000 Visa Gift Card plus a year’s supply of Dreamfields Healthy Pasta. First Runner Up – Apple Watch Series 3 plus a family pack of Dreamfields Pasta! Second Runner Up – $200 Spafinder.com gift card plus a family pack of Dreamfields Pasta! Additionally, I want to know your favorite hacks. Share them using the hashtag, #healthyhacks. I’ll be choosing my favorite one at the end of the program to send a goodie box of Dreamfields pasta to! 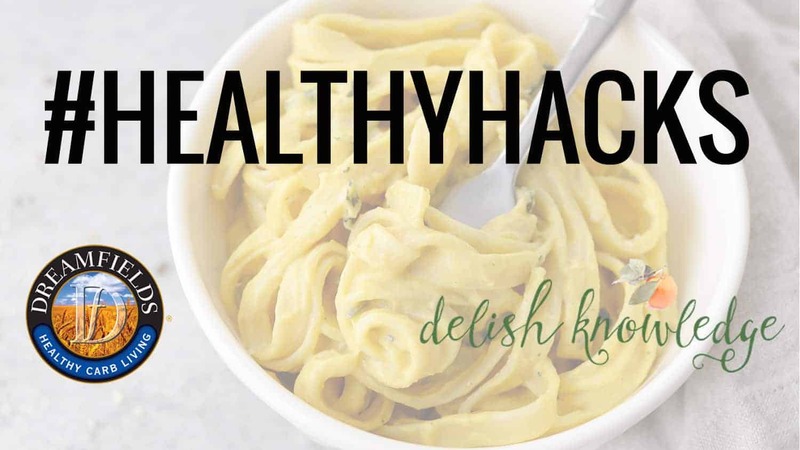 Healthy Hack #1: Try cashew cream instead of heavy cream in your favorite recipes. It’s no secret that I love cashew cream. It’s my secret weapon in just about all of my cream-based sauces on this site. While it’s not only delicious, it’s an easy way to reduce intake of saturated fat and cholesterol. Try it in my creamy butternut squash fettuccini, creamy butternut squash fettuccini, spicy cheese sauce and black bean tacos. Man, I love me some pesto. I make a batch a few times a week in the summer to put on just about everything: grilled vegetables, pasta, bread, eggs, tofu salad and more. It’s the perfect way to add in a some healthy fats and I’m almost convinced that pesto tastes great on anything. However, pine nuts can be expensive. I don’t always want to shell out $10+ dollars for a bag of pine nuts, just to make pesto. Therefore, I often use pistachios instead. Not only do they provide a gorgeous green color (hello antioxidants!) but they are a great source of protein and fiber. See my easy recipe in the video above. Pasta salad might be one of my favorite side dishes. Since we eat pasta at least once a week, I almost always have a cup or two of cooked pasta lying around. To repurpose leftovers, I’ll combine it with whatever vegetables I have in the fridge to create an effortless pasta salad that’s perfect for lunch. Lately I’ve been making this dressing to go on top. Creamy greek yogurt instead of mayo, a bit of lemon juice, apple cider vinegar and a pinch of salt/pepper and sugar. I promise you won’t even miss the mayo; another great way of getting in a little more protein. 4. Healthy Hack #4: Use pre-cut vegetables to save time. It’s no secret that I love vegetables. 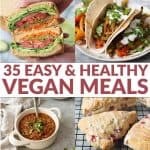 I try to eat at least a serving of them with every meal, whether that’s spinach in my morning smoothie, a big salad for lunch or mushroom tacos for dinner, vegetables are one food I can’t get enough of. However, for as much as I like eating them, I’m usually not super keen on cutting them. When it comes time to make dinner, I’m usually so exhausted from the day that laziness starts to creep in. 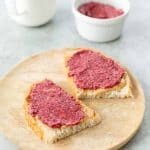 Even if I had the best of intentions to serve a nutrient-rich meal, I sometimes swap in take-out or pizza when I can’t muster up the energy to prep and cook. That’s why I’ve started buying precut vegetables at the store. I know, I know. It seems like such a silly thing, but I swear I’ve increased my vegetable consumption three-fold by doing it. I’m much more likely to make a salad if I’ve got baby greens or spinach leaves in my produce drawer then chopping up a head of romaine. Same goes for winter squash. I can’t get enough of squash this time of year, but I dread chopping up a butternut squash. That’s why I buy precut bags and containers of it instead. It ends up being an extra dollar or two more, but to me, this healthy hack is worth it. To add even more vegetables into your diet, try batch roasting them. I make a big pan of roasted vegetables weekly for easy eating throughout the week. They will keep for 3-5 days in the fridge and are available to throw into grain bowls, pasta, salads or on their own. What’s in your pantry right now? This is a big one I work on with clients; making sure your pantry and fridge is stocked with foods you actually want to eat. For me, this means having on hand lots of simple proteins (like veggie burgers, tofu and canned beans), healthy snacks (hummus, sliced fruit, nuts, trail mix), precut vegetables (see above) and fiber-rich grains like brown rice, farro, quinoa and of course, Dreamfields pasta. Having these items on hand makes meal planning easy. I can make endless combinations of meals that balance carbohydrates, protein, healthy fats and vegetables. Just like my cashew cream sauce in hack #1, pureed cauliflower is my secret weapon in creating thick, luscious sauces without the use of butter or cream. Not that I avoid these foods- I don’t. However, I’m usually on the lookout for more nutrient-dense versions of my favorite foods and this sauce fits the bill. I use cauliflower cream sauce in my wild mushroom lasagna recipe in my cookbook and in this creamy pesto pasta. Place steamed cauliflower, milk of choice (I use unsweetened almond milk 99% of the time), and softened garlic into a high-powered blender. Then puree until creamy and smooth. This sauce works perfectly with Dreamfields pasta for a cauli-fredo fettuccini or as the base for a creamy soup. Don’t forget to head here to enter to win free pasta and more prizes (like a $1000 gift card and an Apple watch!) Share your #healthyhacks on social media for an extra entry into a goodie bag from me filled with Dreamfields pasta.